MagicJack's new version of the device allows free calls from cellphones in the home and cellular carriers are not happy about it. [via digitaltrends] The company behind the magicJack, the cheap Internet phone gadget that’s been heavily promoted on TV, has made a new version of the device that allows free calls from cell phones in the home, in a fashion that’s sure to draw protest from cellular carriers. The new magicJack uses, without permission, radio frequencies for which cellular carriers have paid billions of dollars for exclusive licenses. 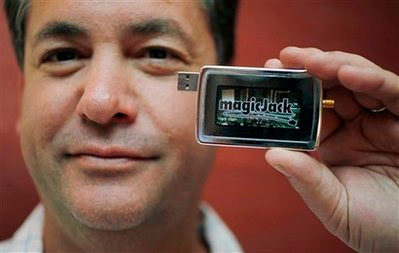 YMax Corp., which is based in Palm Beach, Fla., said this week at the International Consumers Electronics Show that it plans to start selling the device in about four months for $40, the same price as the original magicJack. As before, it will provide free calls to the U.S. and Canada for one year. The device is, in essence, a very small cellular tower for the home. The size of a deck of cards, it plugs into a PC, which needs a broadband Internet connection. The device then detects when a compatible cell phone comes within 8 feet, and places a call to it. The user enters a short code on the phone. The phone is then linked to the magicJack, and as long as it’s within range (YMax said it will cover a 3,000-square-foot home) magicJack routes the call itself, over the Internet, rather than going through the carrier’s cellular tower. No minutes are subtracted from the user’s account with the carrier. Any extra fees for international calls are subtracted from the user’s account with magicJack, not the carrier. According to YMax CEO Dan Borislow, the device will connect to any phone that uses the GSM standard, which in the U.S. includes phones from AT&T Inc. and T-Mobile USA. At a demonstration at CES, a visitor’s phone with a T-Mobile account successfully placed and received calls through the magicJack. Most phones from Verizon Wireless and Sprint Nextel Corp. won’t connect to the device. Borislow said the device is legal because wireless spectrum licenses don’t extend into the home. AT&T, T-Mobile and the Federal Communications Commission had no immediate comment on whether they believe the device is legal, but said they were looking into the issue. CTIA — The Wireless Association, a trade group, said it was declining comment for now. None of them had heard of YMax’s plans. Borislow said YMax has sold 5 million magicJacks for landline phones in the last two years, and that roughly 3 million are in active use. That would give YMax a bigger customer base than Internet phone pioneer Vonage Holdings Corp., which has been selling service for $25 per month for the better part of a decade. Privately held YMax had revenue of $110 million last year, it says. U.S. carriers have been selling and experimenting with devices that act similarly to the wireless magicJack. They’re called “femtocells.” Like the magicJack, they use the carrier’s licensed spectrum to connect to a phone, then route the calls over a home broadband connection. They improve coverage inside the home and offload capacity from the carrier’s towers. But femtocells are complex products, because they’re designed to mesh with the carrier’s external network. They cost the carriers more than $200, though some sell them cheaper, recouping the cost through added service fees. YMax’s magicJack is a much smaller, simpler design.